ALBUQUERQUE, N.M. — His pressed white chef’s coat is easy to spot in the glimmering morning light at the Santa Fe Farmers’ Market.utive chef Andrew Cooper of Terra calmly make his way around the market, it’s clear that he’s no stranger here when it comes to purchasing fresh, local food for his restaurant at the Four Seasons Resort Rancho Encantado Santa Fe. First stop: Cooper fills a large bag with vibrant purple, yellow cheddar, crisp white and lime green romanesco cauliflower. Next, he procures enormous heads of celeriac (or celery root) and a bag of Jimmy Nardello Italian frying peppers that he asks the farmer to fire up in the chile roaster for him. Cooper then collects an abundance of cherry tomatoes and large heirloom tomatoes. Along the way he adds beets, radishes, garlic and corn to the morning’s purchases. Everything gets loaded into his portable shopping cart. “I come twice a week during the season and every Saturday during winter because I like building relationships and trust with the farmers,” Cooper says. “When I’m planning my menus, I ask the farmers what’s coming in next. Anyone can open a box, but when you know where the food comes from, that’s where the love of food begins,” he says. Cooper’s abiding love of food is evident as he describes his personal journey in the restaurant business. Growing up on Long Island in New York, he started working at a local country club sweeping floors and washing dishes during junior high and high school. One day someone from the kitchen crew didn’t show up, so Cooper took over at the grill. Another day he filled in for banquets. Then he worked the sauté station. Within a year he had worked at every station in the restaurant and decided that if he was going to think about food for more than eight hours a day, he might as well get paid to do it. 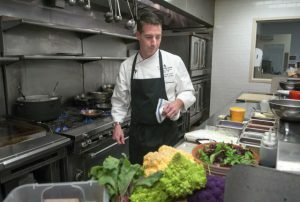 After a tour of the nearby Culinary Institute of America (CIA) in Hyde Park, N.Y., he “felt as if the gates of heaven had opened up.” His parents still thought accounting might be a better career choice, so he tried a stint filing papers at a friend’s insurance company, but after a month of paper cuts, he says, he knew cooking was the right path for him. Cooper received his culinary training at the CIA and finished with an externship at the famous Bouley in NYC, where he worked 16-hour days. On his days off, he worked at restaurants around the city to experience as many varieties of cuisine as possible. But when he overheard older kitchen staff complaining about how difficult it was to transition their careers in their 40s and 50s, Cooper decided to expand his schooling while he was still young. He headed to Florida for a bachelor’s degree in hospitality management and a master’s degree in food service management. The next several years were transformative: He cooked in Switzerland, Italy, Australia and Taiwan. When he realized he loved traveling, he joined the Four Seasons in New York and continued with them in California and Hawaii before arriving in New Mexico. “Everywhere I’ve worked, I learn from the local culture. When I had the opportunity to come to New Mexico I couldn’t wait to see what grows in the desert. I’ve been blown away,” he says. 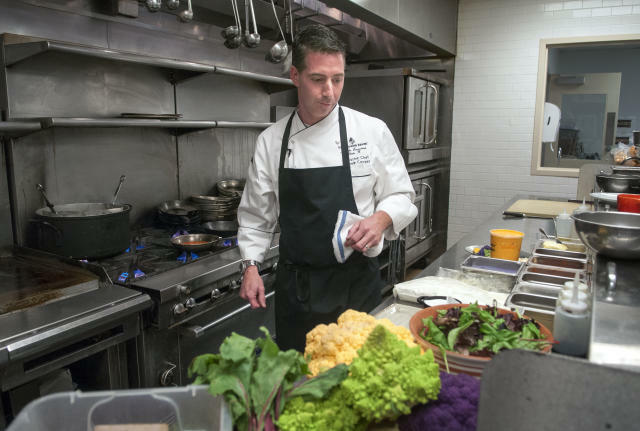 In addition to what he purchases from local farmers – some of who are also his dishwashers – Cooper also cooks from the vegetable garden he started right outside his office. “This space was empty so I went around the property and found containers that weren’t being used and started this garden. I grow lettuce, onions, eggplant, tomatoes, zucchini, chard, arugula, kale, bell peppers, bok choy, jalapeños, radishes, basil and thyme. Next year we’ll also build hoop houses for some of the boxes so I can grow all year,” he says. In addition, knowing where our food comes from is essential to Cooper because “cooking is all about having fun and nothing tastes as good – or is as much fun – as local,” Cooper says. “People watch ‘Chopped’ or the ‘Iron Chef’ and get excited but are petrified. Buying local food and talking to farmers makes it fun. Jump in. Take the first step. Say OK, I’m going to try this,” he says. “We went to the Old Windmill Dairy in Estancia and milked goats, watched Michael and Ed Lobaugh pasteurize milk and press it down into chevre. Now when it’s served on this fresh Beet, Fig and Goat Cheese Salad, everyone has a better appreciation for the food,” he explains. Cooper shows how simple it can be to make great food. Of course it helps to know a few tricks like warming figs that are first dipped into sugar or reducing balsamic vinegar into syrup, but starting with ultra-fresh ingredients is key. While Pan-Seared Scallops with Cauliflower Puree and Carrot Reduction may not become your go-to recipe on a busy weeknight, the dish is straightforward, the results delicious and the techniques for transforming the vegetables are great to have in your cooking toolbox. Originally published in The Albuquerque Journal October 8, 2014. Terra restaurant is at the Four Seasons Resort Rancho Encantado Santa Fe, 198 State Road 592, Santa Fe, and is open seven days a week.